Since ancient times in India, there have been various religious paths which used meditation as a method to reach enlightenment. It is said that Guatama Buddha, the founder of Buddhism, had also reached enlightenment through deep meditation. Based on this event, all of the Buddhist schools have given the highest importance to the practice of meditation. In particular, it was in China where a wide trend developed which emphasized this path to enlightenment . This school of thought regarded Buddha's meditation and ultimate experience (Buddha's Jodo) as the true starting point of Buddhism. From this early trend arose the foundations of Zen Buddhism. According to legend, Bodhidharma (5-6c? ), is considered to be the respected founder of the Chan Buddhism and the great ancestor of the Masters lineage who attained the Buddha mind. The Chan Buddhist school ripened and flourished in China during the Tang and Sung dynasties.Many Zen school branches called Goke-Shichishu were formed and numerous prominent Zen masters appeared in China during this period. Zen Buddhism virtually blossomed on the fertile Chinese soil before taking root in Japan. The seeds of Zen Buddhism were brought to Japan by monks such as Eisai (1141-1215) and Dogen (1200-1253), who had both traveled to China and made contact with the Chinese masters in their search for the true Buddhist path. Zen was first received in Japan as a new spiritual way for the Samurai class which was in power during the latter term of the Heian period. Zen was also incorporated into the Japanese medieval culture and was reflected in traditional arts such as tea ceremony, flower arrangement, Noh drama, etc. Since those early days, Zen has continued to live on with the support and determination of the many courageous Dharma seekers who are anxious to help mankind and spread Buddhism to all corners of the world. Currently Japanese Zen and other Asian Zen Buddhist traditions are continuing to gain popularity in many Western countries and elsewhere. It is difficult to sum up the nature of "Zen". However, it lies in the following phrase, "I have attained enlightenment simultaneously with all sentient and insentient beings." 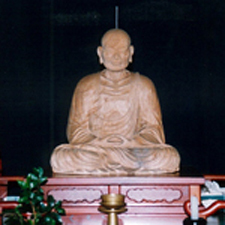 It is delivered in Zen tradition as Shakyamuni Buddha's declaration of his enlightenment. This thought was transmitted to Japan in the 13th century through China. Master Dogen, the founder of Soto Sect in Japan, states, "To study Buddhism is to study the self. To study the self is to forget the self. To forget the self is to be enlightened by all things. To be enlightened by all things is to be free from attachment to the body and mind of one’s self and others’ selves." This standpoint comprises not only the personal building-up of one’s own self but also that of others. Our daily life is under the deep influence of wrong assumptions, concepts, and the self-consciousness caused by various desires. Zen Buddhism therefore tries to realize the real self and attain enlightenment. To attain this state, one should make untiring efforts to practice "Zazen" (the seated meditation), following the manner of Shakyamuni Buddha, Master Dogen, and Master Keizan. It is difficult to state briefly the essential standpoint of "Zen". But it lies in the following phrase, "Above the heavens and below the heavens, I alone am an Honoured One!" This is delivered as Sakyamuni's declaration when he was born. Zen Buddhism was transmitted to Japan in the 13th century through China. Master Dogen, the founder of Soto Sect in Japan, states, "To study Buddhism is to study the self. To study the self is to forget the self. To forget the self is to be enlightened by all things, to be free from attachment to the body and mind of one's self and other's selves". Our daily life is under the complete influence of thoughts, ideas and conceptions, which are nothing but the outcome of the self- conciousness caused by the various desires. The real life-to-be, or the real "I" cannot be anything conceived in our brain, but can be the real fact that "We are living". Needless to say, it comprises the personal building-up of other's selves as well as one's own self. To attain this state, one should be devoted to the practice of "Zazen" with a pure motive and a firm determination. Make a fist with your left hand, with the thumb tucked inside, and place it in the pit of the stomach. Cover the fist with your open right hand. Keep your elbows away from your body, and position them so that both your forearms are in a straight line. 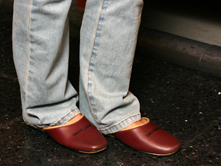 Shashu is a form used in walking. Put both hands flat together. Place the tips of your fingers at the level with your nose, and keep your elbows away from your body. Gassho is an expression of respect, faith and devotion. Enter the hall crossing the threshold with your left foot first at the left side of the entrance. 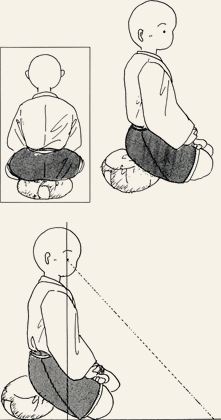 Stop to make a slight bow before Shoso-Bosatsu (Manjushiri, Bodhisattva of Wisdom and Intellect).Then, approach a seat keeping to the left (or the back) of Shoso-Bosatsu. You should not pass in front of Shoso-Bosatsu. Choose a seat as you like, and make a bow in Gassho toward the seat. It is called "Rin'i Monjin," an expression of your salutations to people sitting on both sides. Turn clockwise, and make a bow in Gassho toward the opposite side of the hall. It is called "Taiza Monjin," an expression of your salutations to the person sitting on the opposite side. Hold up your body with both hands placed on the mat, and quietly slip on to a round cushion.The wooden edge of the seat is used as a dining table, so you should pay attention not to put your feet or buttocks on it. Bend forward, and put your slippers on the round tile below your seat. Sit on Zafu cushion allowing your buttocks to rest on the front part of the cushion. Then, put your right foot on your left thigh and your left foot on your right thigh. Your body will be supported on three points: buttocks on a cushion and both knees resting on the mat. Sit on a Zafu in the same manner as the full-lotus posture. Next, bend one knee to bring the foot close to your Zafu, and put your other foot on your opposite thigh. This posture is easier for most beginners, and is also an authentic method. Sway gently from side to side a few times, and then gradually decrease the swing. You will find a position of balance in the middle when your body stops rocking. It is calledSayu-Yoshin. Place your right hand face up on your lap close to your stomach, and put the fingers of your left hand on the fingers of your right hand. Curve your hands into an oval, so that the tips of your both thumbs lightly touch each other. This is called "Hokkai-Join," the form of hands used in. With your legs and arms positioned, stretch your spine upwards with your shoulders relaxed. Try to keep your back naturally straight, by pushing the buttocks out slightly and the stomach out forward. Then, pull the chin down slightly and stretch the neck upwards as if being pulled up from above. Keep your eyes open naturally, and look downwards at an angle of roughly 45 degrees to focus on a spot on the seat about one meter or so in front of you. You will find your eyes being neither opened widely nor completely closed. Settled into your sitting posture, take a deep breath through the nose, and then breathe out slowly through the mouth. It is called "Kanki-Issoku." After repeating this a few times, close your mouth and breath normally through your nose. Your tongue should be placed against the roof of the mouth. In practicing Zazen, you should not concentrate on any particular object nor meditate on any ideas. Nor you should try to dispel, escape or be freed from all ideas and all thoughts. When various ideas arise in your mind, let them alone without pursuing them and being caught by them. The most essential thing is to awaken from distraction or dullness and to return to the right mental state moment by moment. Wait for the start of a session by sitting in a Full- or Half-Lotus posture with your back torwards the wall. A chief Zen master comes into the hall last, makes a bow to Shoso-Bosatsu, and walks around the hall to check all participants. This is called "Kentan." When the master walks up to you, salute him in Gassho. After the master has finished “Kentan" and has taken his seat, a bell is rung to indicate the start of the session. 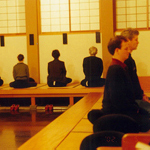 At this point, all people except the master turn around and sit in the style of Zazen facing the wall. When you are overcome by drowsiness or caught by some thought while practicing Zazen, one receives a hit on the shoulder with a wooden stick named "Kyosaku" to drive them away. To request it, keep on sitting in Gassho until a Jikido, an instructor, walking round the hall, comes up behind you. Also, the Jikido may direct you to receive a hit without your request if he considers you to be in need of awakening. In any case, make a bow in Gassho when Jikido gives you a slight touch with a Kyosaku on your right shoulder from behind. Then, incline your head to the left and lean your body forward lightly with your hands kept in Gassho. After the Jikido hits your shoulder, straighten yourself out again and bow in Gassho, and then, keep on practicing Zazen in Hokkai-Join. When the bell is rung to indicate the end of a session, make a bow in Gassho and then place your hands facing up on your thighs. Sway from side to side, and then increase the swing gradually. Unfold your legs, and turn round to face the center of the hall. Get off your seat with your legs stretched out to the ground. At this moment, move slowly and never hurry, especially when your legs have gone to sleep. Place your crushed Zafu cushion vertically, and push it on its top to restore its round shape. Make a bow in Gassho toward your seat(Rin'i Monjin), and then turn clockwise and make a bow again toward the opposite side(Taiza Monjin). When the practice of Zazen is done for a long time, we include a walking Zen named "Kinhin" for about 10 to 15 minutes. Standing in front of your seat, turn to the left to make a procession with the other members. Hold your hands in the form of Shashu and keep your upper body as in the same posture as in sitting. At the end of a session, the chief master leaves the hall first. After him, all participants make a procession to leave the hall headed by the person sitting at the farthest seat from the entrance. You are requested to keep your hands in Shashu while standing in front of your seat, and then join the line at the tail of the procession when the previous person comes up to your front. At the entrance, cross the threshold exiting with your right foot first at the right side. In the hall, all instructions are given with several sounds of a bell and a drum. When Zazen begins, the bell is rung three times. This is called Shijo-sho. When Kinhin begins, the bell is rung twice, and is called Kinhin-sho. 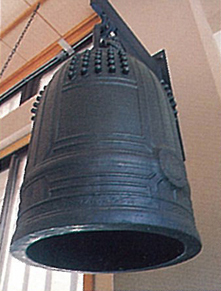 When Kinhin is finished, the bell is rung once, and is called Chukai-sho. And when Zazen is finished, the bell is also rung once, and is called Hozen-sho. Located in the hall are a huge drum and a wooden plate called Moppan. Both of these are struck as the time alarms. A wooden block in the shape of a fish called Ho and a metallic plate in the shape of a cloud calledUnpan, are both sounded to indicate mealtimes and other occasions.